It is suitable for most bicycles with the wheel diameter of from 20-inch to 28-inch and 700C road bike. The side kickstand is mainly made of durable aluminum alloy material. For safe and convenient to park your bicycle. With easy to install and durable to use. It is really a wonderful bike bicycle kick stand for choice. - Adjustable height: from 31cm to 36cm. - High quality Adjustable Aluminum Alloy MTB Road Bike Bicycle Side Kickstand Kick Stand. - Fit for most bike bicycles with the wheel diameter of from 22-inch to 27-inch and 700 road bike. - Steady Aluminum alloy leg with adjustable height and non-slip rubber foot design, for safe and convenient to park your bike. - Easy to install, and steady stand. Material:Made from high quality aluminum alloy material,durable and lightweight soft rubber for bicycle. Anti-slip designed plastic foot,make your bike parking more convenient. Easy One Point Fixation: Use the 5mm wrench, install easily. Also comes with one 4mm wrench for length adjustment. 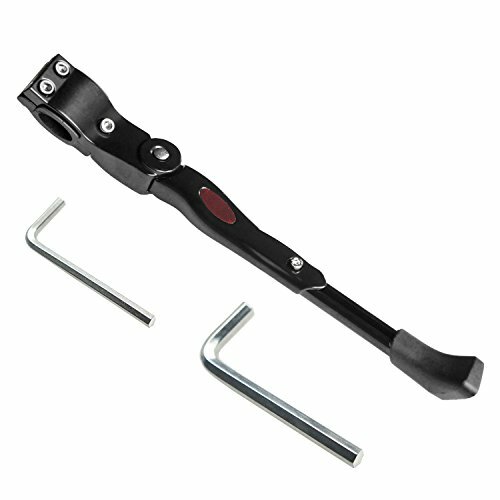 Length Adjustable: Loosen the screw in the middle of kickstand with the 4mm wrench.Then adjust the kickstand from 12'' to 16''. Suitable for: 20'' 22'' 24'' 26'' 28" and 700C MTB BMX Mountain Bike, Road Bike,Folding bike-fixed and etc. Package Include: 1 x Adjustable Bicycle Kickstand, 2 x Wrench. We offer 30 days money back and one year free replacement warranty. If you have any questions about this product by Outtag, contact us by completing and submitting the form below. If you are looking for a specif part number, please include it with your message.